How Canada-Proof Is Your House? 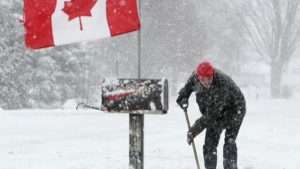 Canada dishes out some of the most extreme climate conditions on the planet, so we certainly have an incentive to get the whole housing and energy efficiency thing right. Where I live we experience a 70ºC temperature swing over the course of a year. Some Canadian regions are even worse. So how “Canada-proof” is your home? Is it really up to the job of keeping you warm in winter, cool in summer and financially solvent? With winter past us for a little while, don’t just breathe a sigh of relief. Now’s a good time to look at how your home could be better energy-wise, then make improvements happen before the cold, cruel blasts swoop down on us again. Acting now will also help you stay more comfortable during this summer’s hot weather. This is what Canada-proofing your house is all about, and it isn’t complicated. Success depends on understanding where to spend your money wisely, and how to find financial help making it all work out. The first time I heard an expert talk about “maximum” insulation levels was in the 1970s. Trained wisdom at that time said that R12 in the walls was all you needed. Any more was a waste of money. Funny thing is, that number kept going up. Today minimum wall insulation levels are twice what was considered the maximum, with plans to increase these minimums even more. When I built my own house in 1989, I put the outrageous amount of R27 in the walls. Other builders told me I was crazy. Today R27 is pretty close to normal. Soon it will be substandard. The most energy efficient home I know has R70 in the walls. The fact is, there’s never too much insulation. The more you put in, the less you’ll spend on energy. Aim for a minimum of 22 inches in the attic (more is better) and you’re off to a great start. Plenty of insulation and a draft-free home are great, but they’re only the start. Now that you’ve stopped energy losses to the outdoors, you need to take on the job that used to be handled by cracks, gaps and drafts. You need to ventilate intentionally. There are some building professionals who maintain that mechanical ventilation is not needed in homes, but if your interest is in maximum health and energy efficiency, then there’s nothing to think about. Installing a heat recovery ventilator (HRV) is a no-brainer. It delivers fresh air into your home from the outside, it pushes stale, toxin-laden indoor air outdoors, and it reclaims most of the energy invested in the heated and cooled air that’s being exchanged. The #1 question I get from Canadians having trouble with their homes goes back to the unmet need for mechanical ventilation. Every truly efficient home needs an HRV. Government is in the business of requiring certain minimum insulation levels be present in new homes, and they’ve served notice that they will play a larger and more demanding role in this area in the future. But government also puts its money where its mouth is, at least in part. Canada has some of the most wide-ranging grant financial incentive programs to help pay for energy upgrades. I’m always surprised at how much effort and money it takes to build our homes and keep them supplied with energy. Unless you knew better, you’d figure that Canadians would have no more money to spend on anything else. The fact we do is proof that we’re on the right track, though there’s still lots of room for improvement.